Last week the Osaka International School of Kwansei Gakuin was featured in the Japan Times. The Japan Times is the oldest English newspaper in Japan. They recently formed a relationship with the New York Times and publish their newspapers together. To read the full article, please follow the link below. 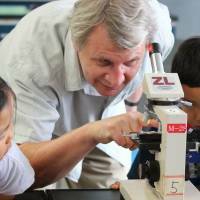 The photo above shows OIS biology teacher Paul Stone teacher working with our elementary students in the science lab.